Since I can’t wear “real” clothes these days, I’ve been satisfying my urge to shop by buying online for The Biscuit. 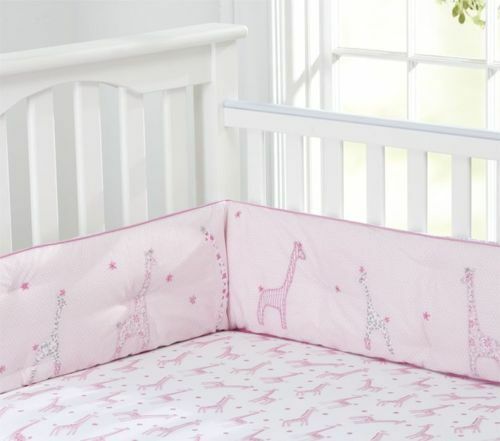 Many popular children’s brands have bedding collections that almost always include crib bumpers. There is no evidence that crib bumpers protect against injury, but they do carry a potential risk of suffocation, strangulation, or entrapment because infants lack the motor skills or strength to turn their heads should they roll into something that obstructs their breathing. The city of Chicago was the first in the nation to ban the sale of crib bumpers and Maryland’s ban goes into effect next year. So, if they’re no good, why are major retailers still selling them? I suspect it’s because people are still buying despite the risks. The safety rules change all the time and it’s hard to keep up. I understand some people can’t get past the aesthetic appeal of crib bumpers and will buy them solely because they’re cute. Skip Hop sells an adorable bumper-free bedding set that we’ll be using. Drop-side cribs can trap babies between the mattress and the rails. Most modern cribs have fixed side rails. Babies should sleep on their backs, never on his stomach or side. Car seats and other baby seats should not be used for sleeping. Babies should sleep in the same room as parents, but not in the same bed. Keep all soft bedding (blankets, pillows, stuffed toys, etc.) out of the crib. Crib mattresses should be firm and covered in a tight fitted sheet. Supervised tummy time is recommended daily to help with development and to avoid flat heads. In other news: I have reached the point in pregnancy where I get to stop worrying about everything that will (but actually won’t) go wrong, and can finally focus on fun things like registering and nursery decor. At 33.5 weeks, we’re (finally) registered at Amazon.com.